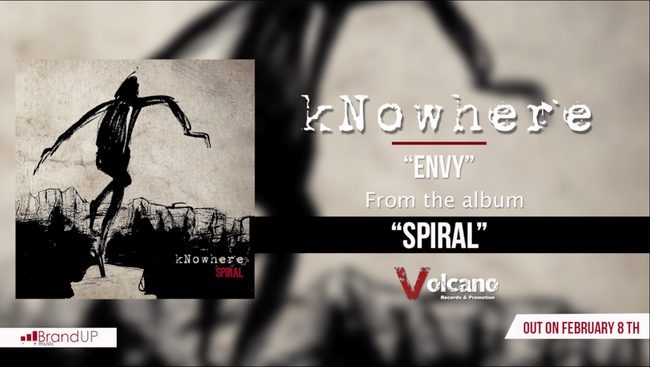 The new single from kNowhere: "Envy" is now available on the Volcano Records & Promotion YouTube channel. The song goes to anticipate the release of the new album of the band "Spiral", whose release is scheduled for February 8th. "Envy" will be the fourth track of the album and is an energetic song, in which post-rock and post-grunge find an impeccable balance, between aggressive guitar riffs, a raspy and interesting voice, arpeggios always accompanied by a light crunch and a punchy and overwhelming rhythm section. What comes out of it is a song with an underground vein, with a full and credible sound that sometimes reminds the Biffy Clyro and with which the Turin power trio sends a clear message: they are not joking with them and are ready to start their journey artistic with awareness and seriousness, flanked by one of the most active independent record labels on the Italian rock and metal scene.